Tracy Leparulo, founder of Blockchain Futurist Conference organizer, Untraceable Inc., spoke to us about the inaugural Blockchain Futurist Conference to be held in Toronto later this year. August 15th & 16th, 2018. This will be the first Blockchain Futurist Conference. I have been running events in the blockchain and crypto space since 2013 and have attended many blockchain events around the world. Of those I organized, many have been firsts — the first Bitcoin Expo in Canada, first Ethereum event in the world, first Security Tokens Conference, also known as Polycon — and have seen the space flourish over the past five years. The blockchain community attracts so many different types of people, but much of the discussion in blockchain is siloed within each industry, which is not conducive to innovation. The industry has grown enough and it’s finally the right time to bring all of the different communities together and discuss the future of the blockchain: what have we learned so far, how we can overcome the hurdles for true disruption in the many industries, and how it will be part of our everyday lives. We wanted to create a premier event where those who are enthusiastic about the disruptive potential of blockchain can speak with, and not at, each other, and leading companies would have the platform to announce new developments, research, and partnerships. It’s going to be the place where attendees will be educated, inspired, and be the first to know big changes in the industry. The conference is the first truly crypto integrated event. In every aspect of the conference, we want to encourage the use of crypto as a day-to-day experience and take away its stigma. Attendees who buy their passes with crypto are offered significant discounts. For example, for a limited time, passes are available at a 75 percent discount for those who pay with cryptocurrencies. Onsite, there will be many integrations with cryptocurrencies, including BTC giveaways, zero-fee Bitcoin ATMs all around the venue, a marketplace of with over 70 vendors that accept crypto, and surprise airdrops from participating partners. We are looking forward to displaying blockchain in the real world. Those attending will get exclusive access to big announcements from leading companies in the blockchain industry. Meet and network with as many people as you can as there are so many unique projects and people attending. The event is professionally designed to foster networking and deal-making. Lastly, embrace blockchain and cryptocurrencies with a hands-on approach at the conference. People can buy tickets at futuristconference.com. We currently have a promotion for two-for-one tickets on the website! Most of our events sell out with 2 weeks to the event. We are just under 4 weeks away now and they are selling really fast! 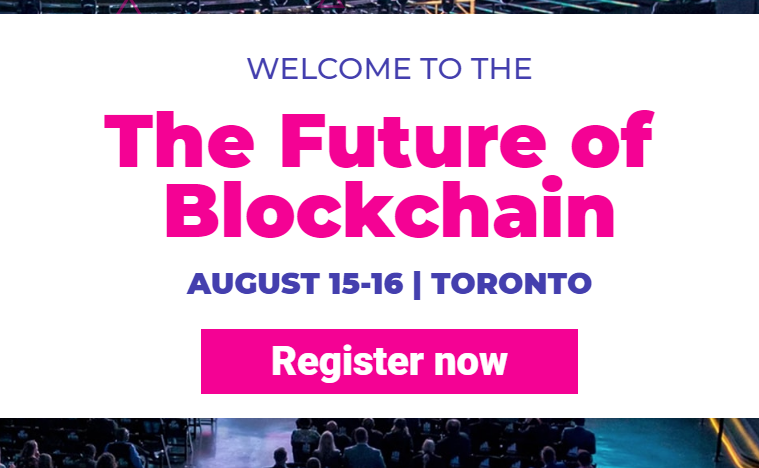 Blockchain is a global phenomenon we will bringing that global audience to Toronto in August to highlight how far this industry has come, what we have learned so far, and what the future may look like. We hope to see you at Blockchain Futurist Conference!